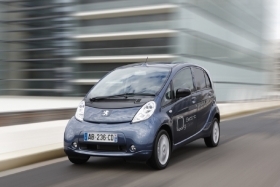 The Peugeot iOn will have PSA's onboard communications and navigation system as standard equipment. PSA/Peugeot-Citroen SA will offer a dedicated, advanced telematics system in its upcoming electric vehicles to differentiate them from the model on which they are based, the Mitsubishi i-MiEV. A new version of Peugeot Connect, PSA's onboard communications and navigation system, will be standard equipment on the Peugeot iOn and Citroen C-Zero when they debut later this year. 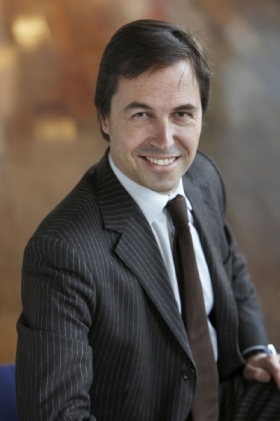 “This will permit us to receive real-time data on the actual use of the cars and the status of their batteries, which will be crucial to helping us better understand exactly how our electric vehicles are being used,” PSA electric vehicles director Ayoul Grouvel told Automotive News Europe in an interview earlier this month. The system also is expected to provide a customer peace of mind because if the electric car's battery runs out of power, help can be reached with the touch of a button, 24-hours a day. Since the car is linked a satellite-based navigation system, the person at the PSA call center can send assistance the exact location of the problem. While Grouvel says there will be few differences between the exteriors and interiors of the C-Zero, iOn and i-MiEV, there is expected to be a big difference in the starting price for the battery-powered minicars. PSA EV boss Grouvel says leasing the Peugeot iOn and Citroen C-Zero will cost less than 500 euros a month. PSA has said that the C-Zero and iOn will cost about 35,000 euros ($38,060) before incentives. With incentives, such as a 5,000-euro subsidy in France, the cars should sell for less than 30,000 euros. Mitsubishi said in March that the i-MiEV would start at 48,000 euros before incentives in Germany. Grouvel said PSA plans to offer lease rates of less than 500 euros a month on its EVs, which also will come with a four-year warranty on the car and its batteries. PSA is expected to reveal full details on its pricing and service packages for the EVs at the Paris auto show in late September. In December, PSA plans to start delivering its first 100 C-Zeros and its first 100 iOns. European sales of the i-MiEV start later this year and the car makes its U.S. debut in mid-2011. The car already is on sale in Japan. Mitsubishi Motors Corp. is under contract to provide a total of 100,000 EVs to PSA by 2015. PSA should get a total of 8,000 EVs in 2011. Annual output is set to rise to 30,000 units a year by the Japanese automaker's 2013-2014 fiscal year. All volumes will be evenly split between the Citroen and Peugeot brands. The three EVs offer room for four people in a layout that is 3480mm long and 1475 mm wide. The minicars have a top speed of 130kph (about 81 mph) and a range per of 130km. Grouvel has done extensive testing of PSA's EVs. For him, cars' most striking feature is their near total silence when operating. “Once you try a car with zero noise emissions, you don't want stop driving in silence anymore,” he said. He added that having the batteries under the platform lowers the PSA cars' centers of gravity, making them more stable than similar-sized models with internal combustion engines.